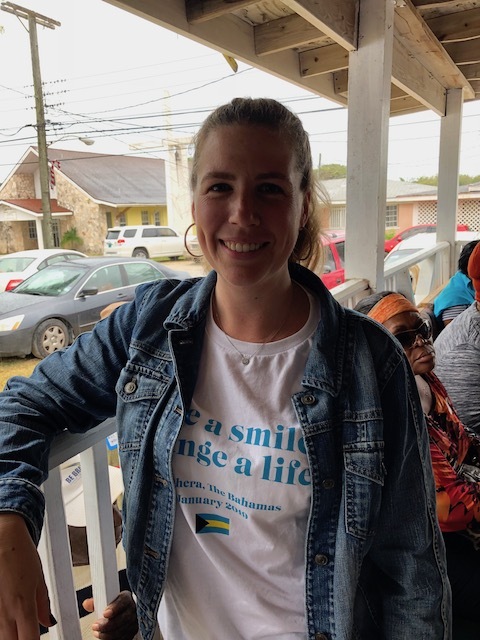 Some of you will have already seen a post I shared about the dental clinic being run in Eleuthera by the GLOgood and Let Love Rule Foundations. But now you are going to get the full length version of my experience visiting the clinic. So this is an initiative started in 2014 where a dental clinic – and I mean big ! – is set up in a hall in Gregory Town. It is a joint venture started by Dr Jon and his wife Stacey Levine and Lenny Kravitz. 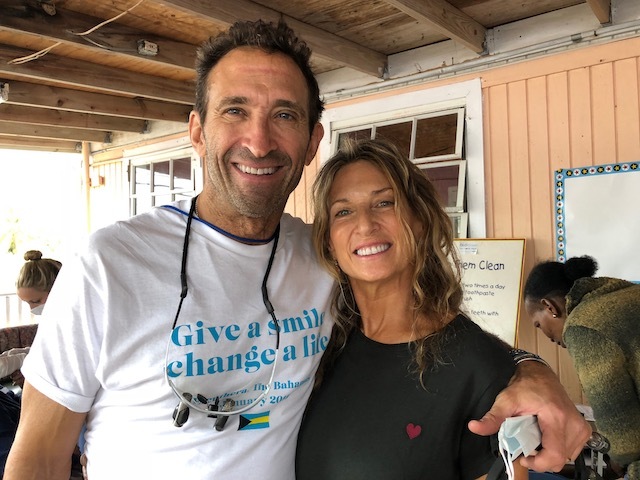 The Levines’ 2 sons are also involved with their own organization called Smile Twice – click on the link and scroll down to watch a wonderful video about the whole set-up. Dr Jon Levine and his beautiful wife Stacey – both very special people …..
Stacey with their 2 sons – Cody and Julian. Their organization is Smile Twice ! This was the fourth year and it has an incredibly powerful momentum. 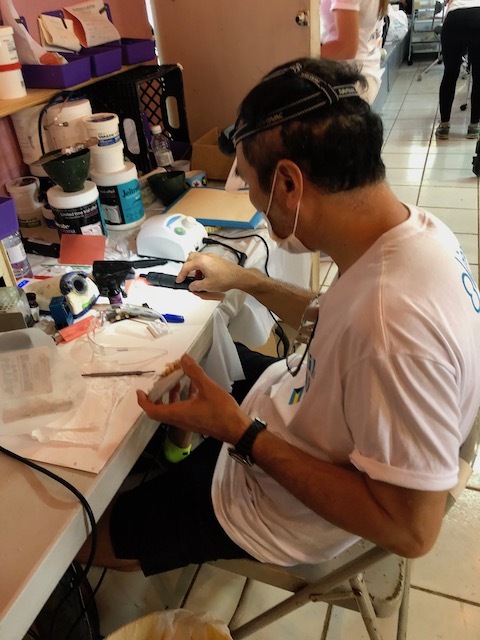 There are around 14 dentists, 7 dental hygienists , dental assistants, 12 nurse practitioners, specialists making dentures, implants, doing root canal work and just about every aspect of dentistry possible. And they are top specialists in their fields. The full team numbers around 60 volunteers. 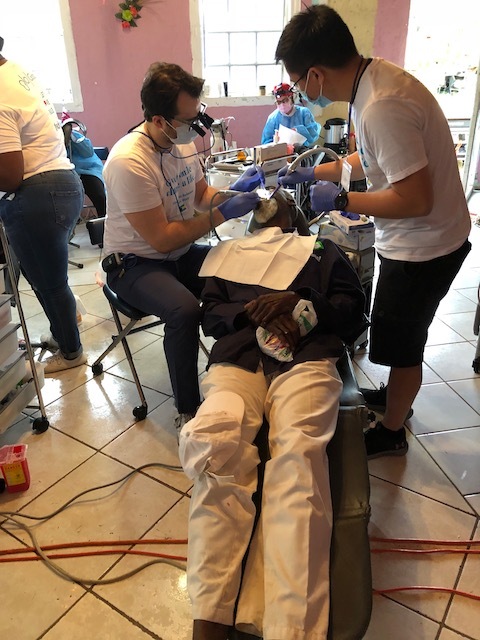 They offer free dental work to all Bahamians and the response is terrific. This time they saw around 500 patients in 4 days – and remember that some of those patients would have had several visits to complete the work. They also counseled them around nutrition and lifestyle choices as well. So who recognizes Tony – the chef from Buccaneer – after 2 extractions and before 2 fillings ! No wonder he looks a little pensive ! I visited on a rainy and gloomy Saturday but the atmosphere was anything but gloomy. 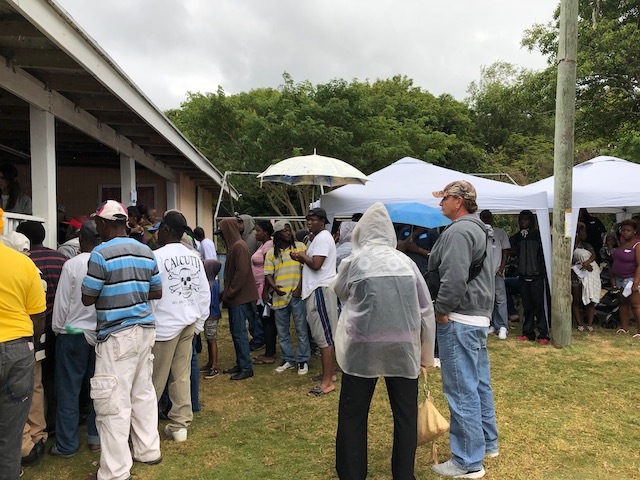 People were queuing up in the rain to be assessed and then treated. Once in the main big hall the atmosphere was astounding. It is a communal clinic – no cubicles or dividing off – and this I think is one of the key things that produces the fabulous atmosphere of love, healing, positivity and real joy ! Now how often to you associate a dental practice with those qualities ? Queuing up in the rain to see the dentists…. Stacey Levine took plenty of time to talk with me and made me feel very welcome during a ridiculously busy time. She is an amazing and beautiful woman – both inside and out, and is so totally motivated to keep making this project the success that it is. She talked to me of the sense of magic that there really is there in that hall along with the motivation from all the practitioners – in fact the full team – to achieve the greater purpose of making people who may be scared and fearful feel more relaxed and recognize that they are in a safe and nurturing environment. Do I sound like I am tripping on something illegal ? – well I’m not I can assure you. It was without doubt one of the most inspiring and uplifting experiences I have ever had ! The work that these people are doing is very special indeed. And to see the smiles on the faces of the patients when work was completed was a joy. While I was there I spoke with quite a few people involved – one was Michelle Henshaw from Boston University School of Dentistry. She is an inspired educator and this year did visit some of the schools locally to talk to the children – and crucially some parents as well – about the effect of all the sugar contained in not just sodas but fruit juices as well. Sugar has a hugely detrimental effect on dental health and she shared with me that many parents believed that they were helping their children by giving them fruit juices instead of sodas. This grass roots level of education is so important and valuable. This was the man making the dentures on site !! I also chatted with Amy Bloom – a very generous second time donor to the campaign. She spoke of how much she loves being there and feeling the atmosphere that I have tried to describe to you ! 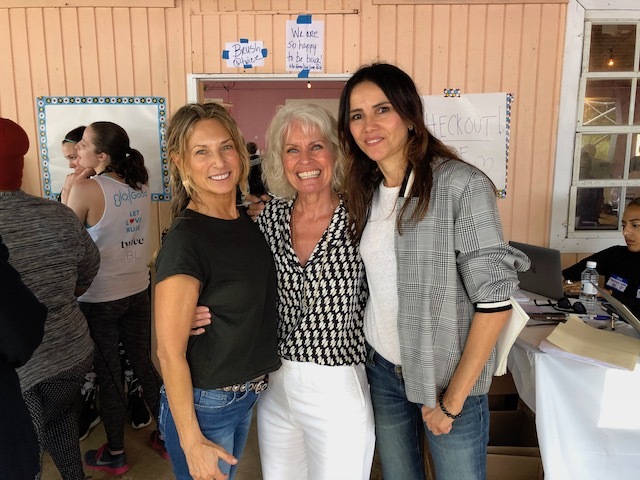 The charming and very generous donor Amy Bloom ….. If you feel that you would like to support this initiative then click on this link where you can donate to the program directly. 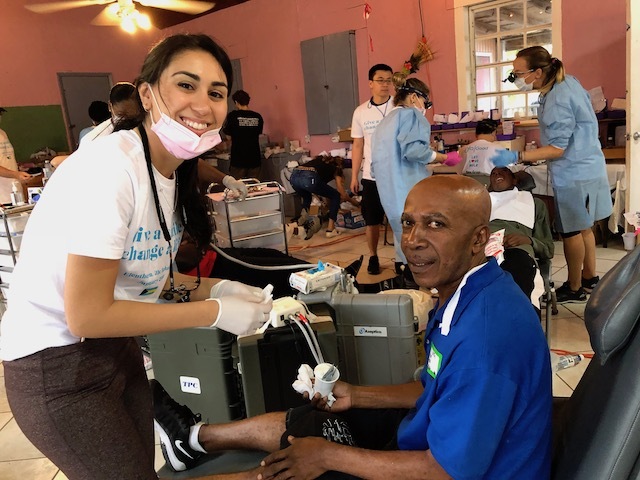 Philanthropy – the desire to promote the welfare of others – is a wonderful thing when you can truly see it in action and share the joy that it can bring – I was so very lucky to be able to have this experience and I hope that by sharing it with you , that you also can have a taste of it….. So sorry there are no pictures of the lovely Lenny – he was there a lot – but just not when I was ! Kathy, What a heart rendering story! Thank you. We do not have anything like that here. Amazing! Wow!! This is an awesome venture! Eleuthera is my birthplace, but I currently live on Long Island. My mom told me about her experience in Gregory Town, and she can’t wait until next year! Long Island could also benefit from this experience, as there isn’t a stationed dentist on the island at this time. The dentist comes once a month and some folks that really need dental care, including children aren’t able to get it. Is it possible to extend this courtesy to the people of Long Island as well? So Tru. Long Island seems to get forgotten. And since Joachin things got even tougher. Samantha, if something can be organized you know you can call on Nerissa to help; as much as she is able with two toddlers. Wonderful!! This made me smile (no pun intended ☺️). Thanks for sharing!